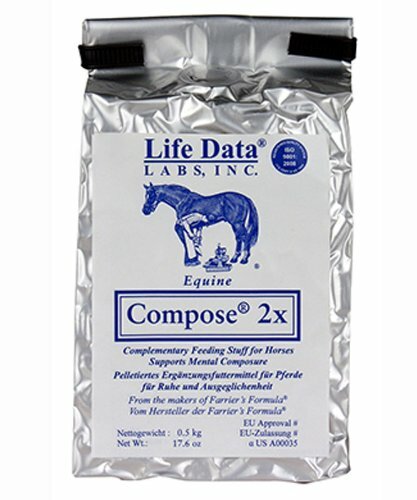 Life Data Labs Compose 2x is a calming supplement formulated for horses or ponies that are prone to being excitable or anxious. Symptoms can be created from activities such as travelling, loading, grooming, farrier work etc, and can put both the horse and owner into hazardous situations. It does not contain any ingredients which lead to a loss of alertness or sedation so is a safer alternative to tranquilisers. Dehydrated Alfalfa Meal; L-Tryptophan; Magnesium Oxide; Fenugreek Extract; Thiamine mononitrate. Feed 2 scoops (85 grams or 3 oz. dry wt.) per 450 kg (1000 lbs.) body weight on an empty stomach. After feeding Compose® 2x allow 1 to 3 hours prior to activities such as loading, hauling, training, showing, new environment, grooming, health maintenance or similar procedures. Compose® 2x can be given with feed as a top dressing twice per day. Feed one scoop (42.5 grams or 1.5 oz. dry wt.) per 450 kg (1000 lbs) body weight in the morning and one scoop in the evening. There are currently no questions for Life Data Labs Compose 2x for Horses - be the first to ask one!